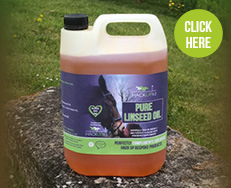 Alex often recommends this cold pressed pure linseed oil for horses which is naturally high in Omega 3 to work alongside weight and strength type bespoke supplements. 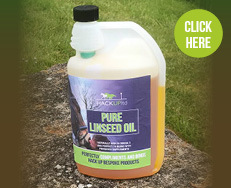 The use of oil in a daily feed is a traditional and proven way of giving the freshest best linseed oil for equines rather than a dried version. The Omega 3 is known to reduce the build up of lactic acid in muscles which is a common cause of fatigue in competition horses. It helps to improve coat texture for a fuller and shinier appearance and can be fed in higher doses to improve condition too.